Silent Barn’s is releasing their financials to anyone who wants to read. Beloved Bushwick DIY venue/housing cooperative/artist colony Silent Barn has been in a bit of a financial bind of late. The popular concert venue, which also functions as an art collective of sorts, has struggled to navigate a coldly indifferent capitalist world, and Silent Barn — technically a for-profit LLC but operating more or less as a non-profit and in the process of transitioning to one — has put out an urgent call for donations as well as paid members. It’s true that one of the saddest sights in the world is a lifeless party struck down by under-attendance. We’ve all been there, at some point, and the sorry scene is always the same: a mostly empty room forms into a joy-sucking vacuum, where laughter feels forced and boozing looks like desperate denial. But nightlife veterans know that parties too big for their britches can be just as bad, and that even great parties will start losing their collective spirit as more and more people pack it in. Last night, dozens gathered in Greenpoint event space Magick City to discuss the current state of DIY spaces in New York and to brainstorm ideas they could offer the Department of Cultural Affairs that would help keep DIY arts and culture spaces operating safely without being prohibitive financially to those running them. The meeting was organized by the NYC Artist Coalition, “an emerging coalition of artists, creative organizations, community leaders, activists, policy makers, and specialists providing mutual support and advocating for informal and affordable community spaces in NYC.” The Magick City discussion was a follow-up to a packed meeting about DIY spaces two weeks ago with the commissioner of Cultural Affairs. This willingness to formally cooperate with a city that is so often seen as actively working against DIY spaces comes hot on the heels of the Ghost Ship fire tragedy in Oakland, an event that shook up the DIY community nationwide and led to increased crackdowns on other homegrown venues. Whenever someone compares Brooklyn to Oakland, an angel loses its wings, and is sent plunging straight down to hell where the sexless being is reborn as an enormous phallus– imagine, like, a hedge fund manager or, in some cases, a real-estate developer. That’s because the observation usually has to do with the proximity of a relatively much more prosperous place like Manhattan or San Fransisco (actually those are mostly just super fancy places no matter how you slice it) and based on dumb facts like that you can take a train between the two (the BART, the MTA respectively). Oh, and there’s also that whole gentrification thing– like parts of Brooklyn, Oakland has been declared fabulously “up-and-coming” (barf). 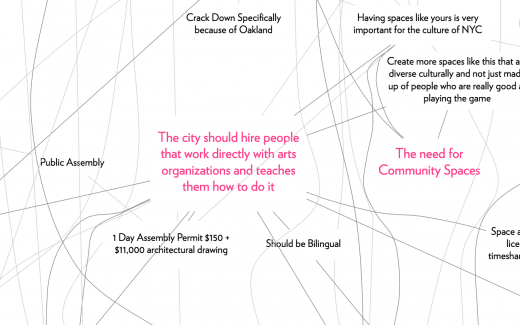 The truth is that, aside from stupid comparisons like these–usually found in real-estate ads, or grunted between high-five’ing bros–Oakland and our beloved borough actually do have some real stuff in common. No matter how much you love your favorite DIY venue, there’s no sense in getting too attached– as anyone who’s been in the game for a while will tell you. But having lost seemingly countless art caverns and show spaces in the last year, we’ve reached a certain moment where posi vibes and healthy acceptance of the city’s natural ebb and flow, suddenly feel less like rational bits of wisdom and more like things we say to make ourselves feel better because everything is terrible right now. Welcome back friends, orphans, Santa assassins, and gainfully employed. This is our time to shine. Join us in grabbing life by the tender parts while everyone else is still blubber-stuffed and belly-up on their parents’ couch, where life has little meaning, and existence sits somewhere between sleep apnea and dreams invaded by Wilford Brimley, who himself is napping, bloated and spread-eagle on a powder blue La-Z-Boy while diabetic sugar-plum fairies shimmy across his spittle-soaked mustache. It was a tough summer for Brooklyn’s DIY scene. There was the sudden shutdown of Palisades, followed by the closure of DIY-gone-legit venue the Acheron; then we lost Secret Project Robot, and soon enough, we’ll be saying RIP Aviv. The troubling number of ousters makes the latest news all the more welcome: Trans-Pecos, last night, announced that a new “annex” is on the way.